It's not too difficult anymore to find everyday basics made with eco-friendly materials such as organic cotton, linen, Tencel, and recycled materials. But independent designer fashion made consciously with care for our planet? That's still much harder to come by due to the limitations that currently accompany small-scaled, slow-made, limited production. This is why I was so impressed by the accomplishments of Corissa Santos and Genevieve Saylak, Co-Founders and Designers behind Where Mountains Meet. 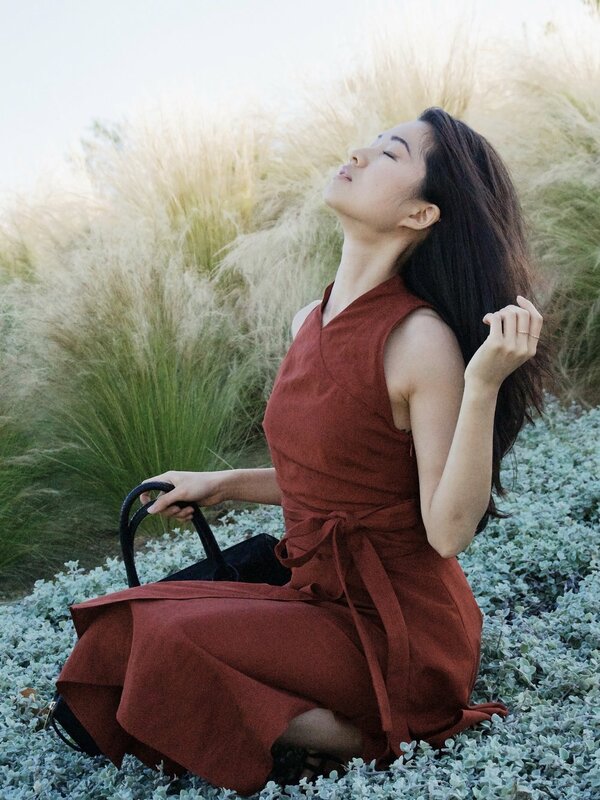 This conscious fashion label, only recently launched in 2015, has already made its way into major fashion publications, national retailers, and the closets of well-known fashionistas. So buckle up and learn from my Heart-to-Heart with these two amazing ladies what it took for them to bring their visions to life; what challenges they still face; how they stay inspired to constantly create; and more! What’s one finding about the fashion industry that still shocks you today? This isn’t the most obscure statistic and at this point it might be a little outdated, but it still shocks me whenever I hear it. That is a lot of clothing that is being replaced and thrown away every year!" What is Where Mountains Meets' purpose? "From the very beginning, our mission was to create a brand where design and responsible practices went hand in hand. After working in the fashion industry for several years, we didn’t see why one was often prioritized above the other. So we set out with the goal to create a brand that was both aesthetically desirable and upheld ethical practices. Now, "responsible practices" can mean a variety of different things, but, for us, it means working with artisan communities and maintaining a commitment to stateside production." What was your biggest challenge in bringing Where Mountains Meet to life? "As an emerging brand, we have a whole host of struggles! One of the biggest challenges that we are working through is: How do we create a responsibly minded brand that is both desirable and competitive in our market? Making clothes responsibly is inherently more expensive than making clothes in the traditional fashion model. So the ever-evolving question is: How do we make beautiful clothes and still compete price-wise with [traditional] brands? We haven’t solved this riddle yet, but we are working on it!" How do you recharge from modern-day burnout? "Work-life balance is very important to us. When things get crazy around here (which they do often!) we make sure to carve out time for the things that help bring a small amount of sanity back into our lives. Sometimes, it may only be an hour for yoga or a quick run, but even the little things help! Oh, and coffee. We find an unhealthy amount of pleasure out of a good cup of coffee." What is one purposeful pleasure you, as conscious fashionistas, take joy in? "We love being apart of a CSA (community-supported agriculture). Much like fashion, there are so many benefits from buying from local producers. Besides getting yummy, fresh food, we are also supporting stateside farmers and creating less of a carbon footprint. [These are] all things that we support and believe in for our own company!" What tip would you give to change makers wanting to translate their purpose-driven visions into reality? "We have learned so much since launching this label, but one of the things that we are most grateful for is the community of people that are invested in our business. I cannot stress how important it is to find more experienced people who believe in what you are doing and to learn from them. You are never going to be fully prepared for a brand new venture, but having people you can bounce ideas off of and learn from is invaluable!" Where do you seek for inspirations that fuel your work? "We are always inspired by nature! As two girls that have mountain roots, it is something that we both find immense inspiration from. Our company name might have given that one away." What makes you hopeful about our world right now? "In fashion, specifically, the increasing interest in ethically and responsibly made clothing is definitely encouraging. Eight to ten years ago, we wouldn’t even be having this conversation. So the fact that people are starting to care about how their clothes are made, even if their buying habits aren’t changing yet, is incredible!"